Firstly, if you thought of Britney Spears when reading that title, we are more alike than you think. Shameful. I’ve had writers block and haven’t really felt there was anything worth writing about of late. As I was reading my book this evening though I thought about what I want about myself to be better; why am I not this and why am I not that? Why do I have to endure this in my life or can’t have that? I’m always thinking that I should eat better, look better, exercise more, be kinder, work harder, be braver. My sisters are better daughters than me, my husband is a better partner than I am, I should take care of the dog better, I should be a better friend, I only have myself to blame for my arthritis flares because of all the previous points… All that goes through my mind in the time it takes for the kettle to boil. Recently my arthritis was very bad and when I can’t walk, can’t work and can’t be the real person that I feel I am, I start doubting lots of other things in my life. It is difficult to maintain a positive outlook when things are going against you in so many areas of your life. Exercise makes me happy and gives me energy, which makes me want to eat well - less meat, more greens, no dairy and less alcohol - which I know would help reduce my symptoms of my arthritis. I then have more ability to work and enjoy time with my colleagues, sleep better and the upward cycle continues. When I lose one of those points in the cycle, everything goes to pot. I’m not exercising, so nothing is encouraging me to eat spinach instead of a cake. I’m lying around at home all day trying to stimulate my brain with books or something on the internet, trying to avoid the tv but then wonder ‘why not just have a glass of wine?’ I can’t drive, so no reason not to! Then I’m less bothered about what I cook or eat and the cycle falls apart. It is well known that chronic illness and depression are linked. Do people get depressed because of the illness they have, or because of what their illness creates in their life? I would not say that I am clinically depressed but I do have very hard days when I cannot see the wood for the trees and feel like there is not much point in trying to achieve something small when I can’t do anything big. Days when my husband is away with work, family are hundreds of miles away and friends are living their normal and busy lives, it is not easy to feel you can pick up the phone or ask someone to come round after work just so you have someone to speak to, but it helps. When I am not doing well mentally, my friends and family somehow know and they always pull it out of the bag and for that I am so lucky. I can get a knock at the door and my sisters have sent me flowers, my friend will drive over from Manchester on her one day off and bring me some homegrown vegetables from her father’s allotment, another friend will turn up with her baby daughter and some cake from the lady round the corner or Chris will ask someone to pop by in the evening for a drink or a jigsaw. At the time I think I want to be left alone, to lie in bed or on the sofa with my books, my phone or even just my spiralling thoughts, but really it is the power of communication and socialising that helps to bring us out of these hard times. Last year just before Rheum For Improvement started, I was off work. I got so low being at home all the time that I spoke with one of my consultant colleagues and they allowed me to come in to work at the back office to do non-clinical tasks. It saved me. 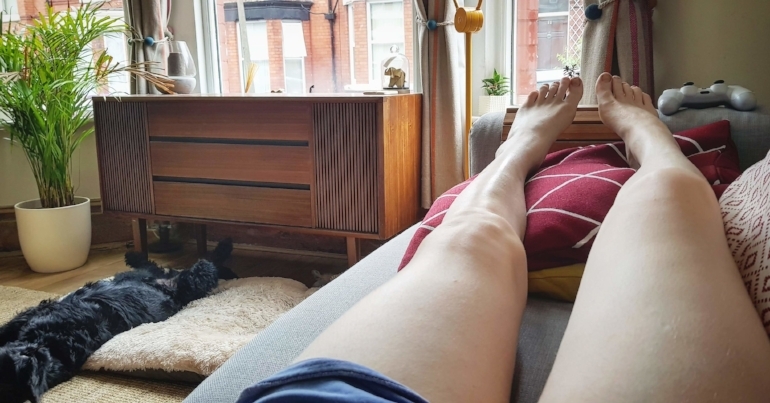 From just getting up in the morning and getting dressed with some makeup on to being around people, talking and communicating, really helped me to then have the confidence to get off my crutches, eat and sleep better and feel more self-worth. So how can we break these cycles? How can we have the courage and the confidence to be the better versions of ourselves in the absence of others or when life sends us these tricky times? Social support is a very important factor for everyone. So many people now are living alone and are lonely. There is so much to love in this wonderful world, it seems such a shame to miss out on it, or feel negative about it when we shouldn’t have to. I started writing this in a very negative frame of mind a few weeks ago when at home late one night whilst in the most pain I recall being in. 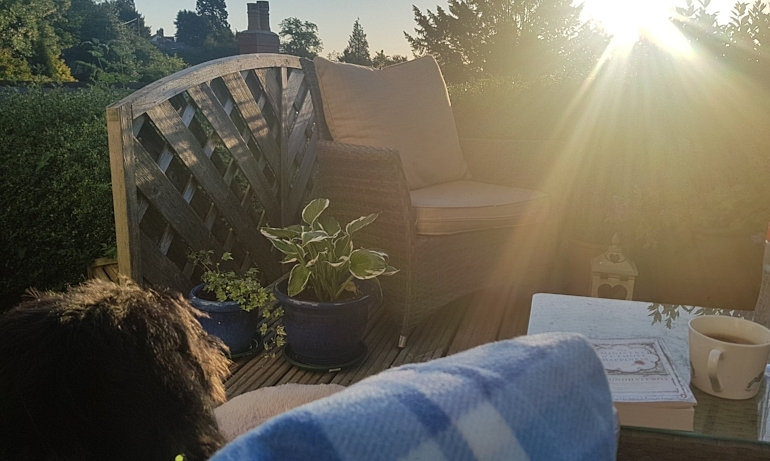 This sentence is being written at 6 in the morning on the terrace of a rental cottage in the Malvern Hills with the sun rising, not a cloud in the sky, my pain improved and my puppy for company whilst others around me sleep. It is blissful and I already think back to my frame of mind before, and it seems quite far away. Environment plays a huge role and so we need to indulge ourselves with the best people, colleagues, friends and surroundings. Pain, like lack of sleep, can skew the mind and rational decision making. When my pain is very bad I have a low threshold for poor decision making, am indecisive and have much more of a laissez faire attitude. Give me some relief and I find more tolerance for making wise and healthier decisions and then the upward cycles begins and allows me to feel better. We all feel like this sometimes and if we can communicate and help each other in times of need I believe we can all be stronger. We need to talk more, share our life experiences to enrich one another, and in turn feel less lonely regardless of if we are physically with others, or they are on the end of a phone. At a time when a lot of my friends are changing jobs and starting a new journey in their career, like myself, we all need to be there for each other and celebrate each other’s greatness! If you ever feel low, drop me a line and we can talk it out together. I am always here as you have all been here for me.